Sure, you ski and snowboard all day long, and you know you have what it takes to conquer any slope any day of the week. Whether it’s a bunny hill or a black diamond run, you took it down like a champ. What if there is something new and exciting that your whole family could take part in together with that same rush of adrenaline? Well, then night skiing in Brian Head is the perfect activity for you. Kids and adults of all ages and experience levels will love hitting the slopes after dark for an unrivaled skiing experience. 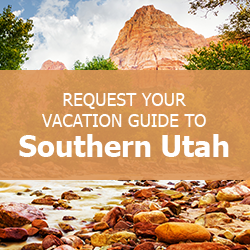 If you’re looking for other great things to do and places to see during the day, check out our free Southern Utah Vacation Guide! With license plates touting the phrase “Greatest Snow on Earth,” Utah is home to some of the best and most consistent skiing conditions, receiving an annual average snowfall of more than 360 inches. Experience the state’s famous powder in a more intimate, laid-back setting than larger, overcrowded resorts. Night skiing cuts down on crowds even more and gives guests the thrill of rushing down a mountain under the stars. Brian Head Resort offers this unique experience on Fridays, Saturdays, and Holiday periods from 4 p.m. to 9 p.m. on one of the four chairlifts at the resort. Inside the Dixie National Forest, Brian Head mountain stands at 9,600 feet—the highest base level in Utah. With 71 runs and eight chairlifts, ski trails cover 650 acres across two mountain peaks. There are green, blue, and black runs to accommodate skiers and snowboarders of all skill levels. If you have any first-timers with you, consider signing them up for the Brian Head Ski School. Take advantage of the day by exploring Southern Utah, and hit the slopes at night for a skiing experience like no other. While many people spend the entire day on the mountain, nighttime offers a whole list of perks. Fewer people are on the mountains at night, so night skiing means short lines and less crowded trails. Brian Head night skiing begins at 4 p.m. Head out right when the slopes re-open to witness a gorgeous Utah sunset as you carve down the mountain. One of the great perks of skiing at night is that you can head out and explore all of the amazing natural wonders that Southern Utah has to offer while the sun is out and still get a chance to ski that day! However, there are things to you need to know and prepare for when skiing in the evening. Here are some tips you should check out before hitting the slopes. Check the weather before suiting up, if temperatures are too low, consider night skiing on a different night. Make sure you dress accordingly. Temperatures are lower at night, making wind chills higher. Bundle up with multiple layers. If your ski goggles are tinted, make sure you thoroughly clean them. Darkened goggles can hinder vision at night. A buddy system is a must when skiing at night. You should always have someone with you in case you fall or wipe out. Snow gets icy after dark. Be careful on your first few runs because the slick snow can create problems. Tune the edges of your skis or snowboard. This makes for a firmer grip when turning. After a full day of enjoying Southern Utah’s finest activities, head back to your warm and cozy Family Time Vacation Rentals property. We feature an extensive list of vacation homes and condos in and around Brian Head, putting you steps from the slopes. Ready to book your ski trip? Check out our rentals and request our free Vacation Guide!